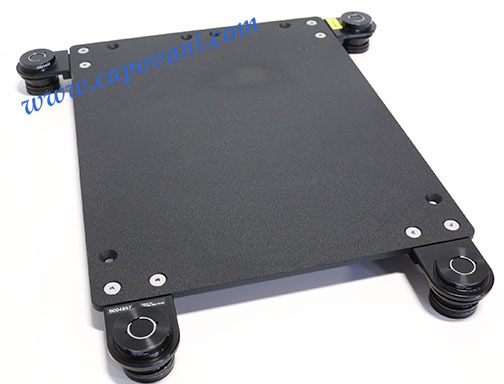 VISTEK NEWPORT MECHANICAL VIBRATION ISOLATION PLATFORM 18" X 24"
In addition to this Newport VIB 320-2947, Capovani Brothers Inc stocks a wide range of used optical tables and vibration isolation tables. Typical manufacturers include Barry Controls, Ealing Electro-Optics, Kinetic Systems, Newport, and Technical Manufacturing Corp.(TMC). Accessories (4) VIB 320-2947 Mechanical Isolators-- max. load per isolator is 47 lbs. Maximum load as confirgured: 140 lb. Other Information The VIB320-2947 bearing is a self-contained unit that provides both vertical and horizontal isolation from 29 lbs (13.2 kg) to 47 (21.4 kg) lbs. The isolators feature a 6.7Hz vertical resonance frequency that begins isolating at 9Hz and a horizontal resonance of 6.3Hz with isolation beginning at 8Hz. This is sufficient performance to eliminate 85% of vibration noise seen within typical laboratories. The VIB320 bearings attach to the VIBe base plate via specially designed brackets that feature a threaded aperture to allow leveling adjustment of the platform.